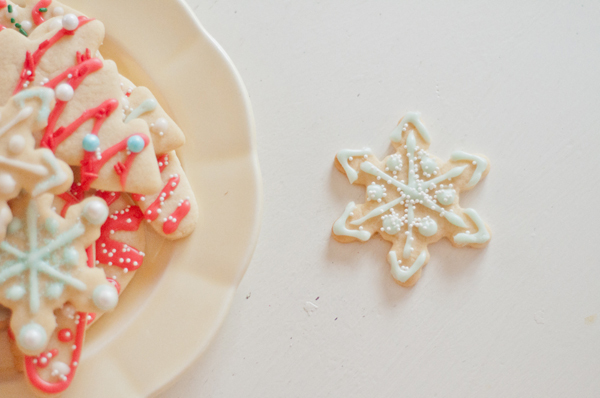 I love beautiful Christmas cookies. 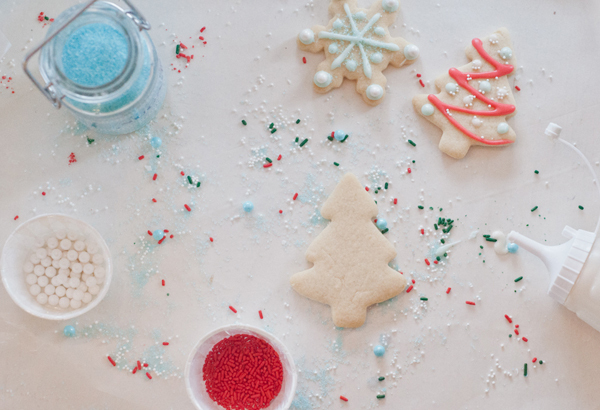 Well, I love beautiful ANYTHING, so cookies cut out in Christmsa shapes and beautiful colors are my favorite for the holidays. Not to mention how delicious and tasty they are! 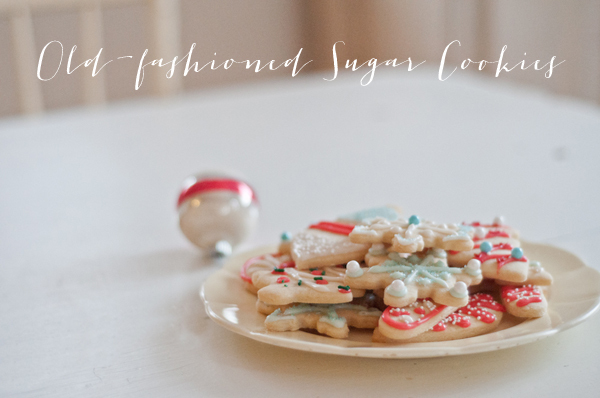 So, today I'm sharing with you my sugar cut-out cookie recipe. For the icing, I filled a small bowl with powdered sugar, a tiny bit of vanilla extract, and just a touch of milk; and stirred. I added more milk until the icing was the consistency of a thick paste or glue. 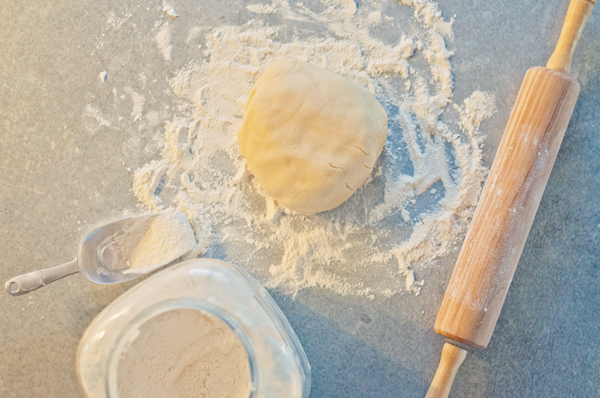 Be careful when adding milk, it's very easy to overdo it and end up with thin icing. If that happens, just keep adding more powdered sugar. 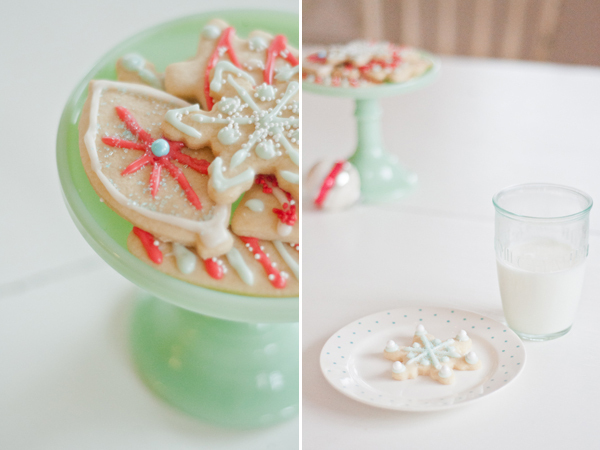 Separate your icing into different bowls and add the food coloring. I like to use squeeze bottles from the grocery store or disposable icing bags. 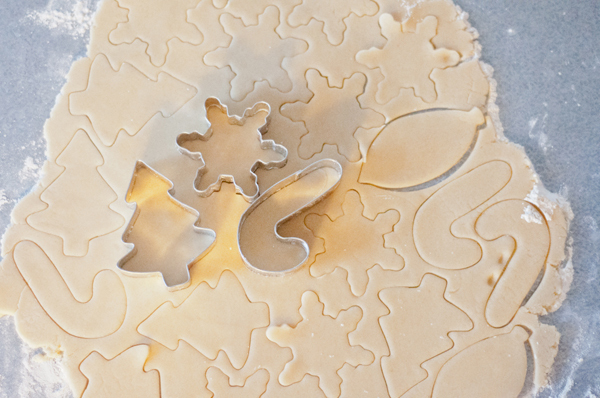 Make sure the cookies are completely cool before frosting them. 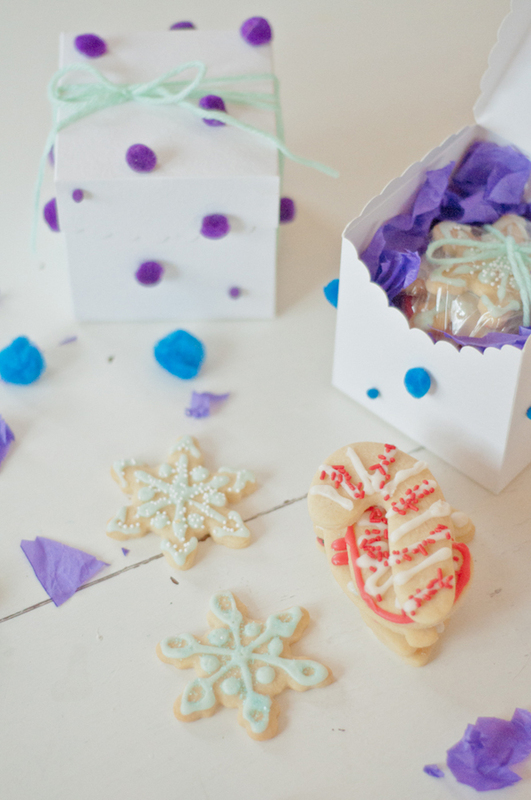 I wanted to send some cookies to a few close friends and family, and was inspired by some packaging from Anthropologie. 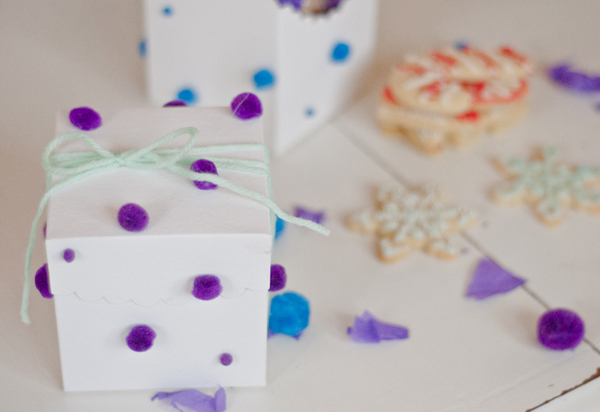 I found some plain white boxes and glued pom poms randomly to the outside of the boxes. Then to cushion the cookies inside, I crumpled some tissue paper in my hand and cut chunks off with scissors to make the confetti. 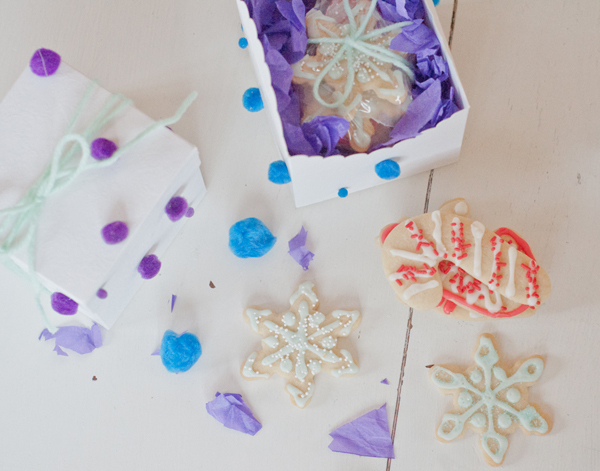 Then, using yarn to tie the boxes shut, the Christmas cookie packages are ready to ship. 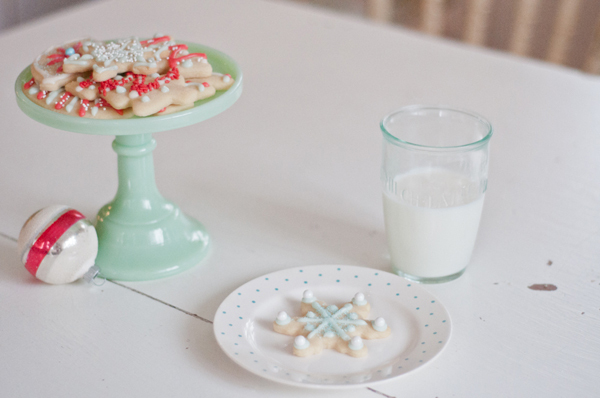 What are your tried and true Christmas recipes? We would love to hear! 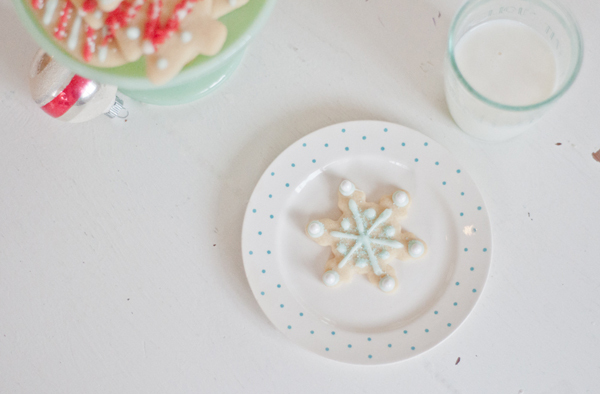 Wow, those cookies are really beautiful. 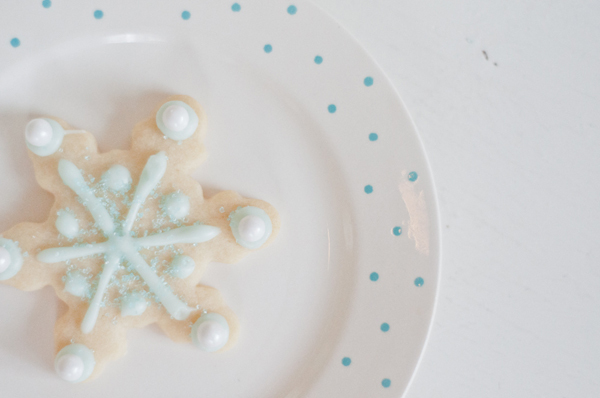 Almost, too pretty to eat. Thank you!! They didn't all turn out that pretty of course. I have an easier time eating the not-so-pretty cookies. Thanks for the recipe--My tried and true is a cherry/pineapple cobbler dessert--Never fails and everyone seems to enjoy it. Merry Christmas! Mmmm. That cobbler sounds amazing! Merry Christmas! I don't know what's prettier, the cookies or your photos. 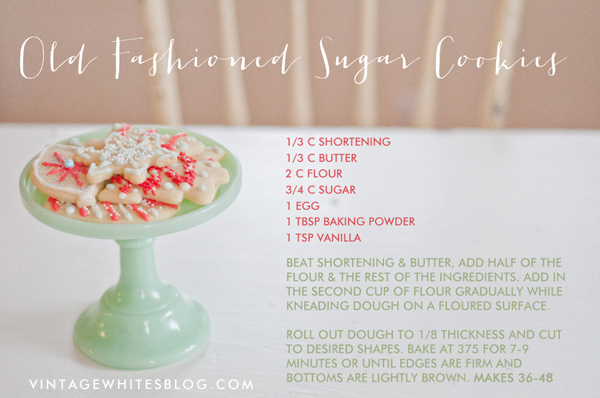 Since there's nothing better than a sugar cookie I'm sure they tasted as good as they look. Thanks so much! Very sweet of you!! I hope you enjoyed your Christmas.